HCM CITY (VNS) — Though her mother and teachers constantly tell her to wear a helmet when riding her electric bike to school, Nguyen Thi Thu Hang of HCM City's Tan Binh District does not because she does not "like it." And many young people in the city are like Hang. Besides, many people who carry their young children on motorbikes do not strap a helmet on for them. From April 6 to 9 the traffic police worked with schools around the city to educate children and their parents about helmet regulations and fines for flouting them. The police patrolled schools for compliance with child helmet laws, stopped people on motorbikes with helmetless children, gave them a "reminder" and reported to their schools. They reminded 951 people in this manner, according to the city Road and Railway Traffic Police. Then, on April 10, the central Road and Railway Traffic Police Department began to fine such violators throughout the country. 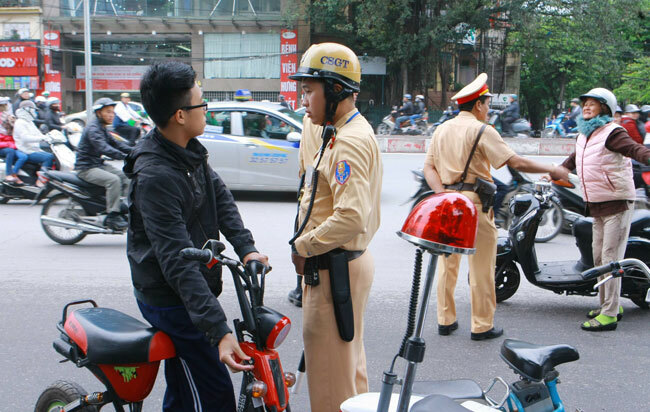 In HCM City 126 students were fined for not wearing or fastening helmets. Sai Gon Giai Phong (Liberated Sai Gon) newspaper quoted traffic police in 20 provinces and cities as saying they fined 755 people on the first day. The campaign is a part of the National Enforcement Action Plan for Child Helmet Use launched on April 2 by the department, the National Traffic Safety Committee, and the Asia Injury Prevention Foundation. Do Thanh Binh, deputy head of the department, said: "Our priority is the safety of children. We will take action to ensure they are protected. The objective of child helmet enforcement is to fulfill our duty to keep all children safe."